The invention discloses front surface conductive silver paste for a solar battery matched with a net-knot-free screen printing plate and a preparation method for the conductive silver paste. The front surface conductive silver paste comprises silver powder, glass powder, an organic binder and an auxiliary, wherein the organic binder comprises organic resin and organic solvents; the organic resin comprises first type resin and second type resin; the ratio of the first type resin to the second type resin is (1:9)-(9:1); and the organic solvents comprise a first type organic solvent with a relatively low melting point, a second type organic solvent with a relatively middle melting point, and a third type organic solvent with a relatively high melting point. By virtue of matching of the silver powder, glass powder, resin with two kinds of glass-transition temperatures Tg, three kinds of organic solvents of different boiling points and the auxiliary, the front surface conductive silver paste for the solar battery can be well adapted to a low-linewidth net-knot-free silk-screen printing metallization process; and compared with the conventional front surface conductive silver paste for the solar battery, the front surface conductive silver paste disclosed by the invention has better printing property, higher depth-width ratio and better thin grid line flattening degree due to the net-knot-free silk-screen printing metallization process, and 0.1-0.3% of photoelectric conversion efficiency can be improved. 本发明属于太阳能导电银浆技术领域，特别是涉及一种匹配无网结网版的太阳能电池正面导电银浆及制备方法。  The present invention belongs to the technical field of solar conductive silver paste, more particularly to a method of preparing the surface conductive silver paste and no network junction solar cell match screen. 随着常规能源不断被消耗、环境问题日益严重，寻求清洁、高效、可再生的能源越来越受到人们的重视。  With the conventional energy continues to be consumed, increasingly serious environmental problems, to seek clean, efficient and renewable energy more and more people's attention. 太阳能作为一种公认的最清洁的能源，受到广泛重视。 Solar energy as a recognized cleanest energy, widespread attention. 太阳能电池是通过光电效应把光能转化成电能的装置。  The solar cell through a photoelectric effect is the conversion of light energy into electrical energy. 太阳能电池的工作原理为：当太阳光照射在晶体硅半导体P_n结上，形成新的空穴-电子对，在p_n结电场的作用下， 空穴由n区流向P区，电子由P区流向n区，接通电路后就形成电流。 The solar cell works as follows: When the sunlight on the crystalline silicon semiconductor P_n junction, forming a new hole - electron pairs, under the action of an electric field p_n junction, holes flow from the n region P region, the flow of electrons from the P region n area, after the forming a current circuit is turned on. 太阳能电池的制作，必须在电池板正面和背面引入电极，其中，正面电极是由正面导电银浆通过丝网印刷成特定图案，然后通过高温烧结而成。 Production of solar cells, must be introduced in the front and back panels electrode, wherein the front electrode silver paste is printed in a specific surface conductive pattern by a screen, and then sintering at high temperature. 传统的正面电极使用的丝印网版副栅线使用有网结的特定的图案，网结的存在限制副栅线的细栅线化、限制提高细栅线的高宽比，而使用无网结的丝印网版可以减少细栅线的宽度，增加正面的接受光面积，提高电池片的短路电流，从而提高电池片的光电转换效率;另外，传统的正面导电银浆通过丝网印刷于晶体硅上，经过隧道式烧结炉烘干、烧结时容易坍塌，高宽比保持不住，从而无法达到提高细栅线的高宽比、提高电池片的电流导出能力的目的，而无网结的丝印网版可以提高细栅线的印刷出的图案的高宽比，减少细栅线的体电阻，提高电池片的电流导出能力，从而增加电池片的光电转换效率。 A conventional front electrode using screen printing halftone sub-gate line use with a network node of a particular pattern, the presence of network node limits thin gate lines of the sub-gate line, and raise the limit thin gate line aspect ratio, the use of non-anastomosing the silk screen can reduce the width of the fine line of the gate, increasing the light receiving area of ​​the front surface, to improve the short-circuit current of the solar cells, thereby improving photoelectric conversion efficiency of solar cells; in addition, the conventional surface conductive silver paste by screen printing on the crystalline silicon , the sintering furnace through the tunnel drying, sintering is easy to collapse, the aspect ratio remains unable to achieve a high aspect ratio can not be improved thin gate lines, the purpose of improving the current capability of the derived cell sheets, silk screen without anastomosing screen printing a pattern that can improve the thin gate line aspect ratio, reducing the volume resistivity of the thin gate lines, to increase the current capability of the battery deriving sheet, thereby increasing the photoelectric conversion efficiency of solar cells. 有鉴于此，本发明旨在研发一种太阳能电池正面导电银浆，能够适用于无网结的丝印工艺，达到减少太阳能电池片正面遮光面积和提高细栅线高宽比的目的。  Accordingly, the present invention aims to develop a solar cell surface conductive silver paste, screen printing process can be applied to non-network junctions, to reduce the area of ​​the solar cell and the front light-shielding fine purpose of improving gate line aspect ratio. 本发明主要解决的技术问题是提供一种匹配无网结网版的太阳能电池正面导电银浆及制备方法，通过银粉、玻璃粉、两种玻璃化转变温度Tg的树脂、三种不同沸点的有机溶剂以及助剂的搭配，使太阳能电池正面导电银浆具有很好的适应低线宽无网结丝网印刷金属化工艺，相对传统的丝网印刷金属化工艺具有更好的印刷性能，更高的高宽比，更好的细栅线平整度，可以提高〇. 1-0.3%光电转化效率。  The present invention solves the technical problem of providing a non-matching network node halftone solar cell production method and the surface conductive silver paste, by silver powder, glass frit, vitrification transition temperature Tg of resin, three different boiling organic solvents and additives with the front surface of the solar cell having a conductive silver paste well adapted to the low line width of no anastomosing a screen printing process metal, metal relatively conventional screen printing process having a better printing properties higher aspect ratio, the better the fine gate lines flatness can be improved square. 1-0.3% photoelectric conversion efficiency. 所述有机溶剂包括相对低沸点的第一类有机溶剂、相对中沸点的第二类有机溶剂和相对高沸点的第三类有机溶剂;其中，所述第一类有机溶剂的沸点范围为150-220 °C，所述第二类有机溶剂的沸点范围为220-270°C，所述第三类有机溶剂的沸点范围为270°C以上；以所述有机溶剂的总重量百分含量计，所述有机溶剂包括第一类有机溶剂2-20%，第二类有机溶剂60-95 %和第三类有机溶剂2-20 %。  the organic solvent comprises a first relatively low boiling point organic solvent, relative to the second organic solvent having a boiling point and a relatively high-boiling organic solvent third; wherein the first type of organic solvent having a boiling point range of 150-220 ° C, a boiling point range of the second organic solvent is 220-270 ° C, a boiling point range of the third organic solvent is at least 270 ° C; the total weight percent of the organic solvent content of the first organic solvent comprises 2-20% organic solvent, the second organic solvent is 60-95% and 2-20% organic solvent third category. 所述第二类树脂包括丙烯酸树脂、乙基纤维素、醋酸纤维素、松香树脂、聚酯树脂、 氨基树脂和酚醛树脂中的至少一种。  The second resin comprises an acrylic resin, ethyl cellulose, cellulose acetate, rosin resin, a polyester resin, at least one amino resin and phenolic resin. 所述第三类有机溶剂包括四甘醇单丁醚、四甘醇、PETA和三甘醇中的至少一种。  The third type of organic solvent comprising tetraethylene glycol monobutyl ether, tetraethylene glycol, triethylene glycol and at least one of PETA. 进一步地说，所述助剂包括触变剂，以所述太阳能电池正面导电银浆的总重量百分含量计，所述触变剂占0.1-5%，所述触变剂包括聚酰胺蜡、改性氢化蓖麻油和聚乙烯蜡中的至少一种。  Further to say, said adjuvant comprising a thixotropic agent, based on the total weight of the front surface of the solar cell conductive silver paste percentage content of the thixotropic agent comprises from 0.1 to 5%, the thixotropic agent comprises polyamide wax, polyethylene wax, hydrogenated castor oil and the modified at least one. 进一步地说，所述第一类树脂和所述第二类树脂比例为1:9-5:1。  Further to say, the first type resin and the second resin ratio of 1: 9-5: 1. 进一步地说，所述银粉的中位径D50为0. 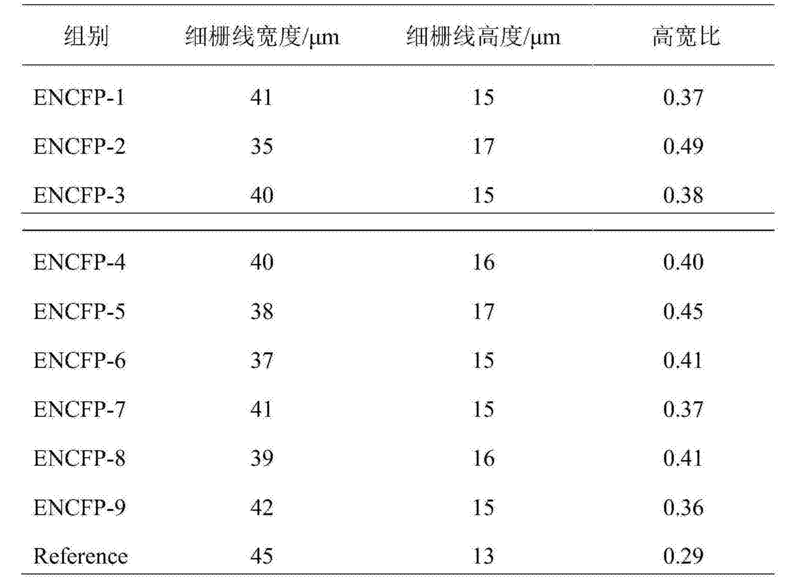 l-lym，比表面积为l-10m2/g。  Further to say, the median diameter D50 of the silver powder is 0. l-lym, specific surface area of ​​l-10m2 / g.
 进一步地说，所述银粉包括纳米银粉或者银的化合物，以所述太阳能电池正面导电银浆的总重量百分含量计，所述纳米银粉占0-5 %。  Further to say, the nano silver or a silver compound including silver to total weight of the front surface of the solar cell conductive silver paste percentage terms, accounting for 0-5% of the nano silver. 进一步地说，所述助剂还包括其他助剂，所述其他助剂包括润湿剂、分散剂、消泡剂和流平剂中的至少一种。  Further to say, said adjuvant further comprises other additives, the additional additives comprise at least one wetting agent, dispersing agent, antifoaming agent and leveling agent. C、将银粉、玻璃粉、助剂和步骤B所制得的有机粘结剂按照银粉85-90 %、玻璃粉0.5-3%、有机粘结剂5-11 %和助剂0.2-3.5%的比例加入离心机或机械搅拌机中，使其混合均匀，然后放入三辊机上研磨2-6次至浆料细度小于lOwii，从而得到太阳能正面导电银浆。  C, the silver powder, glass powder, additives and step B an organic binder prepared in accordance with 85-90% silver, 0.5-3% glass powder, 5-11% organic binder and adjuvants 0.2 3.5% added in a proportion centrifuge or a mechanical stirrer and allowed to mix well, then placed on a three roll milled slurry to 2-6 times less than lowii fineness, to thereby obtain a solar positive conductive silver paste. 五、本发明的太阳能电池正面导电银浆的制备方法简单，操作可控，易于实现产业化。  Fifth, the positive conductive silver paste prepared a solar cell of the present invention is simple, controllable, easy to realize industrialization. 下面对本发明的较佳实施例进行详细阐述，以使本发明的优点和特征能更易于被本领域技术人员理解，从而对本发明的保护范围做出更为清楚明确的界定。  The following preferred embodiments of the present invention will be described in detail, so that the advantages and features of the present invention can be more readily understood by those skilled in the art, in order to make more clearly the scope of clearly defined in the present invention. 所述第二类树脂包括丙烯酸树脂、乙基纤维素、醋酸纤维素、松香树脂、聚酯树脂、 氨基树脂和酚醛树脂中的至少一种，所述丙烯酸树脂优选的是帝斯曼B-890、B-811、B838、 三菱MB-2952和BR85中的至少一种，所述乙基纤维素优选的是Dow STD-4，STD-7，STD-20和STD-50中的至少一种，所述醋酸纤维素优选的是EASTMAN CAB-551-0.01、CAB-551-0.2、 CAB-381-0. l、CAB-381-2、CAB-381-20和CAP-481-0.5中的至少一种，所述松香树脂优选的是EASTMAN Foral 90、Foral 105_E、Foral 110、Pinava Pentalyn G、Pentalyn A和Pentalyn H中的至少一种。  The second resin comprises an acrylic resin, ethyl cellulose, cellulose acetate, rosin resin, a polyester resin, an amino resin and a phenolic resin in at least one of the acrylic resin is preferably DSM B-890, B-811, B838, Mitsubishi BR85 MB-2952 and at least one, preferably is ethyl cellulose Dow STD-4, STD-7, STD-20 STD-50 and at least one of the cellulose acetate is preferably EASTMAN CAB-551-0.01, CAB-551-0.2, CAB-381-0. l, CAB-381-2, CAB-381-20 and CAP-481-0.5 in at least one, preferably the rosin resin is at least one EASTMAN Foral 90, Foral 105_E, Foral 110, Pinava Pentalyn G, Pentalyn a, and Pentalyn H in. 所述第三类有机溶剂包括四甘醇单丁醚、四甘醇、PETA (季戊四醇三丙烯酸酯）和三甘醇中的至少一种。  The third type of organic solvent comprising tetraethylene glycol monobutyl ether, tetraethylene glycol, at least one of PETA (pentaerythritol triacrylate), and triethylene glycol. 所述助剂包括触变剂，以所述太阳能电池正面导电银浆的总重量百分含量计，所述触变剂占〇. 1-5 %，优选的占0.5-1.5 %，所述触变剂包括聚酰胺蜡、改性氢化蓖麻油和聚乙烯蜡中的至少一种，优选的是聚酰胺蜡、海明斯THIXATR0L (改性氢化蓖麻油）ST、 THIXATROL MAX和THIXATROL PLUS中的至少一种。  The auxiliaries include thixotropic agent, based on the total weight of the front surface of the solar cell conductive silver paste percentage content of said thixotropic agent comprises billion. 1-5%, preferably 0.5-1.5% accounted for, the thixotropic agent include polyamide waxes, hydrogenated castor oil-modified polyethylene wax and at least one, preferably polyamide wax, Hemmings THIXATR0L (modified hydrogenated castor oil) ST, THIXATROL MAX and THIXATROL PLUS at least one. 所述第一类树脂和所述第二类树脂比例为1:9-5:1。  The first resin and said second resin ratio of 1: 9-5: 1. 第一类树脂和第二类树脂的比例配比，能够保证第一类树脂和第二类树脂功能的发挥，进而得到低线宽、高宽比好、适用于无网结的太阳能电池正面导电银浆。 Ratio of the first resin and second resin ratio, to ensure a first resin and second resin-based play function, and thus obtain a low linewidth, aspect ratio, suitable for no network junction solar cell surface conductive silver paste. 所述银粉的中位径D50为0.1-lwn，比表面积为l-10m2/g。  The median diameter D50 silver is 0.1-lwn, specific surface area of ​​l-10m2 / g.
 所述银粉包括纳米银粉或者银的化合物，以所述太阳能电池正面导电银浆的总重量百分含量计，所述纳米银粉占0-5% %，优选的是0.1-2%。  The nano-silver or silver compound comprises silver to total weight of the front surface of the solar cell conductive silver paste percentage content of the nano-silver powder accounts for 0-5%%, preferably 0.1 to 2%. 所述助剂还包括其他助剂，所述其他助剂包括润湿剂、分散剂、消泡剂和流平剂中的至少一种。  said adjuvant further comprises other additives, the additional additives comprise at least one wetting agent, dispersing agent, antifoaming agent and leveling agent. 实施例1中有机粘结剂的组成及其重量百分含量（以所述太阳能电池正面导电银浆的总重量百分含量计）：Foral 105-E 0.75%、路博润5703 0.25%、戊二酸二甲酯0.25%、醇酯十二2.75%、二乙二醇单丁醚醋酸酯2.75%和三甘醇0.25%。  The composition and weight percent (based on the total weight of the front surface of the solar cell conductive silver paste percentage content) of the organic binder in Example 1 of the embodiment: Foral 105-E 0.75%, 0.25 Lubrizol 5703 %, dimethyl glutarate, 0.25%, 2.75% twelve alcohol esters, diethylene glycol monobutyl ether acetate 2.75% and 0.25% triethylene glycol. 实施例2中有机粘结剂的组成及其重量百分含量（以所述太阳能电池正面导电银浆的总重量百分含量计）：Foral 105-E 0.4%、路博润5703 0.4%、丙烯酸树脂0.2%、戊二酸二甲酯〇. 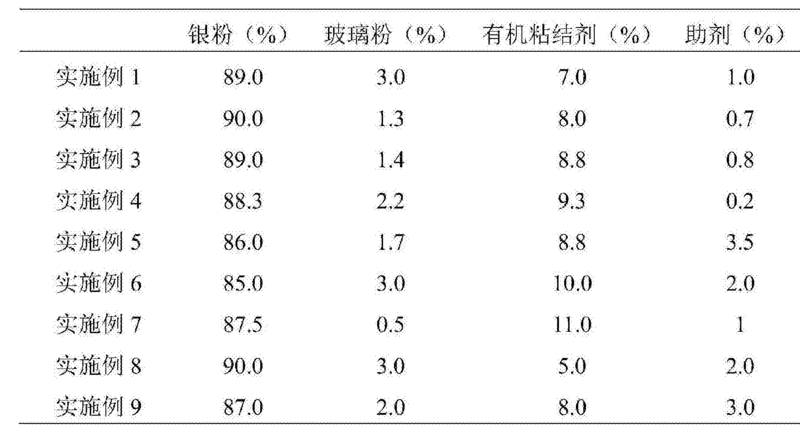 5%、醇酯十二3%、二乙二醇单丁醚醋酸酯3%和三甘醇0.5%。  The composition and weight percent (based on the total weight of the front surface of the solar cell conductive silver paste percentage content) of the organic binder in Example 2 of the Embodiment: Foral 105-E 0.4%, 0.4 Lubrizol 5703 % acrylic resin 0.2%, dimethyl glutarate square. 5%, 3% alcohol esters twelve, diethylene glycol monobutyl ether acetate, 3% and 0.5% triethylene glycol. 实施例3中有机粘结剂的组成及其重量百分含量（以所述太阳能电池正面导电银浆的总重量百分含量计）：Foral 105-E 0.6%、B-890 0.1%、路博润5703 0.3%、戊二酸二甲酯1 %、醇酯十二2.9%、二乙二醇单丁醚醋酸酯2.9%和三甘醇1 %。  The composition and weight percent (based on the total weight of the front surface of the solar cell conductive silver paste percentage content) of the organic binder in Example 3 of the Embodiment: Foral 105-E 0.6%, B-890 0.1% Lubrizol 5703 0.3%, 1% dimethyl glutarate, 2.9% esters twelve, diethylene glycol monobutyl ether acetate 2.9% and 1% triethylene glycol. 实施例4中有机粘结剂的组成及其重量百分含量（以所述太阳能电池正面导电银浆的总重量百分含量计）：EVA树脂0.7%、Foral 105-E 0.5%、B-890 0.5%、戊二酸二甲酯0.5%、二乙二醇单丁醚醋酸酯6.6%和三甘醇0.5%。 Composition and weight percent (based on the total weight of the front surface of the solar cell conductive silver paste percentage content) of the organic binder in Example 4  Embodiment of: EVA resin 0.7%, Foral 105-E 0.5%, B-890 0.5%, 0.5% dimethyl glutarate, diethylene glycol monobutyl ether acetate 6.6% and 0.5% triethylene glycol. 实施例5中有机粘结剂的组成及其重量百分含量（以所述太阳能电池正面导电银浆的总重量百分含量计）：Foral 105-E 0.5%、B-890 0.5%、路博润5703 0.5%、戊二酸二甲酯0.5%、醇酯十二6.0%和三甘醇0.8%。  The composition and weight percent of the organic binder in Example 5 (based on the total weight of the front surface of the solar cell conductive silver paste percentage content) Embodiment: Foral 105-E 0.5%, B-890 0.5% Lubrizol 5703 0.5%, 0.5% dimethyl glutarate, dodecyl alcohol esters 6.0%, and 0.8% triethylene glycol. 实施例6中有机粘结剂的组成及其重量百分含量（以所述太阳能电池正面导电银浆的总重量百分含量计）：TPV树脂0.125%、氨基树脂0.725%、酚醛树脂0.4%、环己醇1.625%、柠檬酸三丁酯5.5 %和四甘醇单丁醚1.625 %。  The composition and weight percentage of the organic binder in Example 6 embodiment (frontal conductive silver paste on the total weight of the solar cell percentage terms): TPV resin 0.125%, 0.725% amino resin, phenolic resin 0.4%, 1.625% cyclohexanol, 5.5% tributyl citrate and 1.625% tetraethylene glycol monobutyl ether. 实施例7中有机粘结剂的组成及其重量百分含量（以所述太阳能电池正面导电银浆的总重量百分含量计）：EVA树脂0.4%、PVA树脂0.4%、STD-7 0.3%、CAB-381-20 0.5%、 Foral 110 0.4%、y-丁内酯0.7%、磷酯三丁酯1.1%、醇酯十二5.4%和三甘醇1.8%。  7 weight percent of the composition and examples of the organic binder (based on the total weight of the front surface of the solar cell conductive silver paste percentage content) Embodiment: EVA resin 0.4%, PVA resin 0.4%, STD- 7 0.3%, CAB-381-20 0.5%, Foral 110 0.4%, y- butyrolactone, 0.7%, 1.1% tributyl phosphate ester, dodecyl alcohol esters 5.4%, and 1.8% triethylene glycol. 实施例8中有机粘结剂的组成及其重量百分含量（以所述太阳能电池正面导电银浆的总重量百分含量计）：TPU树脂0.4%、TP0树脂0.5 %、聚酯树脂0.1 %、糠醛0.6 %、柠檬酸三丁酯2.7 %、四甘醇单丁醚0.5 %和三甘醇0.2 %。  Composition and 8 weight percent of the organic binder in Example (based on the total weight of the positive conductive silver paste percentage content of the solar cell): TPU resin 0.4%, TP0 resin 0.5% polyester 0.1% resin, 0.6% of furfural, 2.7% tributyl citrate, tetraethylene glycol monobutyl ether 0.5% and 0.2% triethylene glycol. 实施例9中有机粘结剂的组成及其重量百分含量（以所述太阳能电池正面导电银浆的总重量百分含量计）：EVB树脂1.25%、Foral 110 0.15%、B-811 0.1%、环己醇0.5%、 丁二酸二乙酯0.5%、二乙二醇单丁醚2.5%、柠檬酸三丁酯2%和四甘醇单丁醚1%。  Composition and 9 weight percent of the organic binder in Example (based on the total weight of the front surface of the solar cell conductive silver paste percentage terms): EVB resin 1.25%, Foral 110 0.15%, B- 811 0.1%, 0.5% cyclohexanol, diethyl succinate 0.5%, 2.5% diethylene glycol monobutyl ether, 2% of tributyl citrate, and tetraethylene glycol monobutyl ether 1%. 对比例：为传统的太阳能电池正面导电银浆，为我公司生产的G10A编号为Reference。  comparative example: the traditional front solar cell conductive silver paste, for my company's G10A number Reference. 1、将上述实施例1-9以及对比例制备的所述太阳能电池正面导电银浆通过无网结网版印刷到晶体硅太阳能电池片上，通过相同的高温烧结，将所得到的电池片进行印刷图案的形貌测试，具体方法为采用基恩士VK-X 3D显微镜观察所述太阳能电池正面导电银浆印刷、烧结后印刷图案的形貌有无虚印、断栅、印刷图案模糊等情况，结果显示:通过观察， 实施例1-9以及对比例制备的所述太阳能电池正面导电银浆印刷良好，均无虚印，断栅和印刷图案模糊等情况出现。  1, the above Examples 1-9 and Comparative positive conductive silver paste prepared by the non-network junction solar cell by screen printing onto the crystalline silicon solar cells by the same high temperature sintering, the resulting battery morphology test sheet is printed pattern, particularly a method of using Keyence VK-X 3D microscopy front surface of the solar cell conductive silver paste printing, the printing pattern after sintering morphology or absence of virtual printing, off the grid, the print pattern blur etc. 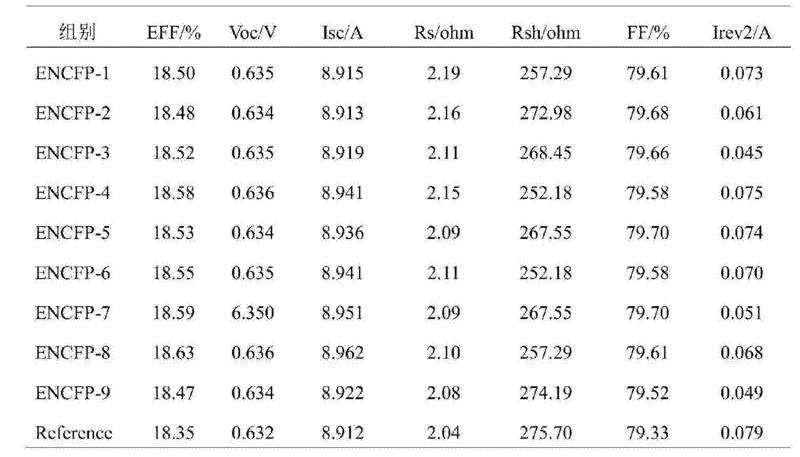 the results show: by observation, Examples 1-9 of the solar cell and a good printing surface conductive paste prepared in Comparative Example, no virtual printing, and the gate-off blurred print pattern occurs. 2、将上述实施例1-9以及对比例制备的所述太阳能电池正面导电银浆进行开路电压(Voc)、光电转换效率(EFF)、填充因子(FF)、并联电阻（Rsh)、串联电阻（Rs)、短路电流(Isc)、反向电流（IreV2)等指标性能测试，测试结果见下表2,其各项指标的测试方法均为本领域常规方法，，具体测试过程与条件均采用统一测试环境、测试条件。  2, the above-described embodiment and Comparative Example 1-9 was prepared the conductive paste for solar cell front open-circuit voltage (Voc), the photoelectric conversion efficiency (the EFF), fill factor (the FF), parallel resistance (Rsh) , performance indicators series resistance (Rs of), short circuit current (Isc), a reverse current (IreV2) and other tests, the test results in Table 2 below, the test method of the indicators are a conventional method in the art ,, and specific test procedure conditions are unified test environment, test conditions. 测试方法描述:电性能(包括开路电压Voc，光电转换效率EFF，填充因子FF，串联电阻Rs，并联电阻Rsh和短路电流Isc)是通过太阳模拟器或IV测试仪测量所得数据。 Test Method Description: electrical properties (including open-circuit voltage Voc, the photoelectric conversion efficiency EFF, fill factor FF, the series resistance Rs, and a parallel resistance Rsh short-circuit current Isc) is obtained by a solar simulator or IV tester measurement data. 太阳模拟器或IV测试仪所用光源光照强度需要通过密封“标片”（密封的电池片)进行校准标定，测量时光照强度需通过“标片”调整为AMI. 5G的光照强度（即lOOOmW/cm2)。 Solar simulator or IV tester used a light source light intensity is required Calibrated by sealing the "standard sheet" (sealed cell sheets), the measurement light intensity which a "standard sheet" is adjusted to AMI. Light intensity 5G (i.e. lOOOmW / cm2). 电性能测试过程中，待测试电池片放置于光源下的真空吸盘上，且吸盘的温度会通过冷却仪控制在24 (± 1) °C。 Electrical performance testing, the battery to be tested is placed on the sheet under a light vacuum chuck, the chuck and temperature controls in the 24 (± 1) ° C by the cooling device. IV测试仪通过扫描电压(-0.2V-+1.2V)和测试电流绘制出明场和暗场条件下的IV曲线。 IV tester scanning voltage (-0.2V- + 1.2V) IV curve plotted under bright field and dark field conditions and test current. 常规电池片电性能数据如:光电转换效率EFF、开路电压Voc、串联电阻Rs、并联电阻Rsh、短路电流I sc和反向电流Irev2均可在上述条件下通过IV测试仪获得。 Conventional solar cells electrical performance data, such as: the photoelectric conversion efficiency EFF, open-circuit voltage Voc, a series resistance Rs, the shunt resistor Rsh, short circuit current and the reverse current I sc Irev2 available through the IV tester under the conditions described above. 电池片的光电转换效率EFF (等同于填充因子FF)是衡量电池片电性能优劣的关键参数。 Photoelectric conversion efficiency of solar cells of the EFF (equivalent to the fill factor FF) is the key parameter to measure the electrical properties of the merits of the solar cells. 填充因子为电池具有最大输出功率时的电流和电压的乘积与短路电流和开路电压乘积的比值。 A battery having a fill factor as a ratio of the current and voltage at the maximum output power is the product of open circuit voltage and short circuit current of the product. 本发明实施例中电性能相关结果均可通过电池片工业上IV测试仪或相关测量工具获得。 Embodiments of the present invention the electrical properties of the correlation results can be obtained by the solar cells or the IV tester related industrial measurement tools. 3、将上述实施例1-9以及对比例制备的所述太阳能电池正面导电银浆进行细栅线宽度测试和细栅线高度测试，细栅线宽度和细栅线高度采用基恩士VK-X 3D显微镜进行测量。  3, 1-9, and the front surface of the solar cell conductive silver paste prepared in the above Comparative Example finely gate line width of the test and the test thin gate line height, line widths and thin gate thin gate line height uses Keene Shi microscope VK-X 3D measurements. 测试结果见表3,其各项指标的测试方法均为本领域常规方法。 The test results are shown in Table 3, the test method of the indicators are conventional in the art. 从表3数据可以看出，采用本发明实施例1-9制备的所述太阳能电池正面导电银浆，通过无网结网版印刷于晶体硅太阳能电池片上，能够明显的减小细栅线的宽度，提高细概线的尚度，从而提尚细概线的尚宽比。  As can be seen from the data in Table 3, using the front side of the solar cell conductive silver paste prepared in Example 1-9 of the embodiment of the present invention, no network node in a screen printing on the crystalline silicon solar cells, can be significantly reduced fine the width of the gate line, improving fineness is still almost line to provide yet still wider than the thin line overview. 以上所述仅为本发明的实施例，并非因此限制本发明的专利范围，凡是利用本发明说明书内容所作的等效结构变换，或直接或间接运用在其他相关的技术领域，均同理包括在本发明的专利保护范围内。  The embodiments described above are only embodiments of the present invention, not intended to limit the scope of the present invention, who made use of the description of the present invention is equivalent structural transformations, directly or indirectly, to other related technical fields, are the same Li included within the scope of protection of the present invention. 1. 一种匹配无网结网版的太阳能电池正面导电银浆，其特征在于：按原料总重量百分含量计，包括银粉85-90 %、玻璃粉0.5-3 %、有机粘结剂5-11 %和助剂0.2-3.5 % ;其中， 所述银粉的中位径D50为0.5-3μπι，比表面积为0.1-1.0m2/g，振实密度为4.0-6.5g/cm3; 所述有机粘结剂（以所述有机粘结剂的总重量百分含量计)包括有机树脂5-20%和有机溶剂80-95 %; 所述有机树脂包括玻璃化转变温度Tg低的第一类树脂和玻璃化转变温度Tg高的第二类树脂;其中，所述第一类树脂的玻璃化转变温度Tg在室温以下，所述第二类树脂的玻璃化转变温度Tg在80°C以上;所述第一类树脂和所述第二类树脂比例为1:9-9:1; 所述有机溶剂包括相对低沸点的第一类有机溶剂、相对中沸点的第二类有机溶剂和相对高沸点的第三类有机溶剂;其中，所述第一类有机溶剂的沸点范围为150-220，°C所述第二类有机溶剂的 A matching network node positive silver paste screen without a solar cell, which is characterized in that: the total weight percent content of the feedstock, including 85-90% silver, 0.5-3% glass powder, organic binder 5 and 0.2 to 3.5% -11% additives; wherein the median diameter D50 of the silver powder is 0.5-3μπι, specific surface area of ​​0.1-1.0m2 / g, a tap density of 4.0-6.5g / cm3; the organic binder (the total weight percent of the organic binder content) comprising an organic resin and an organic solvent 5-20% 80-95%; the organic resin comprises a low glass transition temperature Tg of the first resin and a high glass transition temperature Tg of the second resin; wherein the glass transition temperature Tg of the first resin is below room temperature, the second glass transition temperature Tg of the resin above 80 ° C; the said first resin and said second resin ratio of 1: 9-9: 1; the organic solvent comprises a first relatively low boiling point organic solvent, the boiling point of a second opposite type, and relatively high-boiling organic solvent a third organic solvent; wherein a boiling point range of the first organic solvent is 150-220, ° C of the second type of organic solvent 沸点范围为220-270，°C所述第三类有机溶剂的沸点范围为270 °C以上；以所述有机溶剂的总重量百分含量计，所述有机溶剂包括第一类有机溶剂2-20 %，第二类有机溶剂60-95 %和第三类有机溶剂2-20 %。 220-270 boiling range, the third range ° C boiling organic solvent is at least 270 ° C; total weight of the percentage content of the organic solvent, the organic solvent comprises a first organic solvent-based 2- 20%, 60-95% of the second organic solvent and the third organic solvent 2-20%. 2. 根据权利要求1所述的匹配无网结网版的太阳能电池正面导电银浆，其特征在于:所述第一类树脂包括有机硅树脂、EVA树脂、PVB树脂、EVB树脂、PVA树脂、PVP树脂、TPU树脂、 TPV树脂、TPE树脂和TPO树脂中的至少一种； 所述第二类树脂包括丙烯酸树脂、乙基纤维素、醋酸纤维素、松香树脂、聚酯树脂、氨基树脂和酚醛树脂中的至少一种。 The matching network node without the surface conductive silver paste screen a solar cell according to claim 1, wherein: the first type of resin include silicone resins, EVA resin, PVB resin, the EVB resin, PVA resin, PVP resin, TPU resin, TPV resin, TPE and at least one resin, TPO resin; the second resin comprises an acrylic resin, ethyl cellulose, cellulose acetate, rosin resin, a polyester resin, an amino resin and phenolic at least one resin. 3. 根据权利要求1所述的匹配无网结网版的太阳能电池正面导电银浆，其特征在于:所述第一类有机溶剂包括γ-丁内酯、γ-戊内酯、戊二酸二甲酯、糠醛、环己醇、丁二酸二乙酯、戊二酸二乙酯和磷酸三丁酯中的至少一种； 所述第二类有机溶剂包括二乙二醇单丁醚、二乙二醇单丁醚醋酸酯、醇酯十二和柠檬酸三丁酯中的至少一种； 所述第三类有机溶剂包括四甘醇单丁醚、四甘醇、PETA和三甘醇中的至少一种。 The matching network node without the surface conductive silver paste screen a solar cell according to claim 1, wherein: the first type of organic solvent include [gamma] -butyrolactone, [gamma] -valerolactone, glutaric acid at least one tributyl dimethyl ester, furfural, cyclohexanol, diethyl succinate, diethyl glutarate and phosphoric acid; the second type of organic solvent include diethylene glycol monobutyl ether, at least one tributyl diethylene glycol monobutyl ether acetate, an alcohol ester XII and citric acid; the third type of the organic solvent include tetraethylene glycol monobutyl ether, tetraethylene glycol, triethylene glycol and of PETA at least one. 4. 根据权利要求1所述的匹配无网结网版的太阳能电池正面导电银浆，其特征在于:所述助剂包括触变剂，以所述太阳能电池正面导电银浆的总重量百分含量计，所述触变剂占0.1-5%，所述触变剂包括聚酰胺蜡、改性氢化蓖麻油和聚乙烯蜡中的至少一种。 The matching network node without the surface conductive silver paste screen a solar cell according to claim 1, wherein: said adjuvant comprises a thixotropic agent, based on the total weight of the front surface of the solar cell conductive silver paste percent content of the thixotropic agent comprises from 0.1 to 5%, the thixotropic agent comprises at least one polyamide waxes, hydrogenated castor oil and modified polyethylene wax. 5. 根据权利要求1所述的匹配无网结网版的太阳能电池正面导电银浆，其特征在于:所述第一类树脂和所述第二类树脂比例为1:9-5:1。 The matching network node without the surface conductive silver paste screen a solar cell according to claim 1, wherein: said first resin and said second resin ratio of 1: 9-5: 1. 6. 根据权利要求1所述的匹配无网结网版的太阳能电池正面导电银浆，其特征在于:所述银粉的中位径D50为0.1-1μπι，比表面积为l-10m2/g。 The matching network node without the surface conductive silver paste screen a solar cell according to claim 1, wherein: said silver powder median diameter D50 is 0.1-1μπι, specific surface area of ​​l-10m2 / g.
7. 根据权利要求1所述的匹配无网结网版的太阳能电池正面导电银浆，其特征在于:所述银粉包括纳米银粉或者银的化合物，以所述太阳能电池正面导电银浆的总重量百分含量计，所述纳米银粉占0-5 %。 The matching network node without the surface conductive silver paste screen a solar cell according to claim 1, wherein: said nano silver or a silver compound comprises silver, the total weight of the solar cell front surface of conductive silver paste percentage terms, accounting for 0-5% of the nano silver. 8. 根据权利要求4所述的匹配无网结网版的太阳能电池正面导电银浆，其特征在于:所述助剂还包括其他助剂，所述其他助剂包括润湿剂、分散剂、消泡剂和流平剂中的至少一种。 The matching network node without the surface conductive silver paste screen a solar cell according to claim 4, wherein: said adjuvant further comprises other additives, the additional additives include wetting agents, dispersing agents, at least one defoaming agent and leveling agent. 9. 根据权利要求1所述的匹配无网结网版的太阳能电池正面导电银浆的制备方法，其特征在于:包括以下步骤： A、 有机溶剂的配制：将第一类有机溶剂、第二类有机溶剂和第三类有机溶剂按照一定配比混合，依次使用分散机、乳化机和搅拌机将混合物混合均匀，得混合有机溶剂； B、 有机粘结剂的配制:将重量百分数为5-20%的有机树脂加入到80-95%的步骤A得到的混合有机溶剂中，搅拌l_2h，溶解后得到均匀透明的有机粘结剂； C、 将银粉、玻璃粉、助剂和步骤B所制得的有机粘结剂按照银粉85-90 %、玻璃粉0.5-3%、有机粘结剂5-11 %和助剂0.2-3.5 %的比例加入离心机或机械搅拌机中，使其混合均匀，然后放入三辊机上研磨2-6次至浆料细度小于ΙΟμπι，从而得到太阳能正面导电银浆。 9. A method for preparing a conductive paste without the front screen of the network node matches the solar cell as claimed in claim 1, characterized in that: comprising the steps of: A, an organic solvent is prepared: a first organic solvent, second organic solvent and the third organic solvent in a certain mixing ratio, used sequentially dispersing machine, an emulsifying machine and a stirrer and the mixture was uniformly mixed to obtain a mixed organic solvent; B, formulated organic binder: from 5 to 20 weight percent % of the organic resin added to a mixed organic solvent of 80-95% obtained in step a stirred l_2h, after dissolution to obtain a homogeneous transparent organic binder; C, the silver powder, glass frit, adjuvants and prepared by step B organic binder in accordance with 85-90% silver, 0.5-3% glass powder, 5-11% and the proportion of 0.2 to 3.5% organic binder was added adjuvants centrifuge or a mechanical stirrer and allowed to mix well, then 2-6 milled slurry to a fineness of below ΙΟμπι placed on the three-roll mill to obtain a conductive silver paste solar positive.